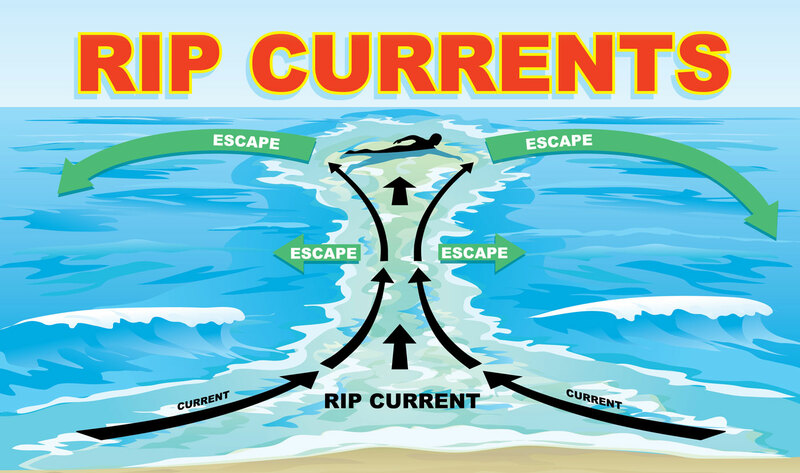 Visitor Safety Alert: What Are Rip Currents in Hawaii? There’s nothing more relaxing and rejuvenating than swimming in Hawaii’s crystal blue ocean. But, beneath the waves are powerful forces that could be dangerous, especially for visitors who are unfamiliar with Hawaii’s waters. According to howstuffworks.com, rip currents are the beach’s number one killer. Rip currents in Hawaii occur when water rushes through a low point in a sandbar. Since waves keep pushing more water into the basin between the sandbar and the beach, the rip current may continue for several minutes, or even several hours. Some rip currents are brief occurrences, but others are long-term fixtures of an area. 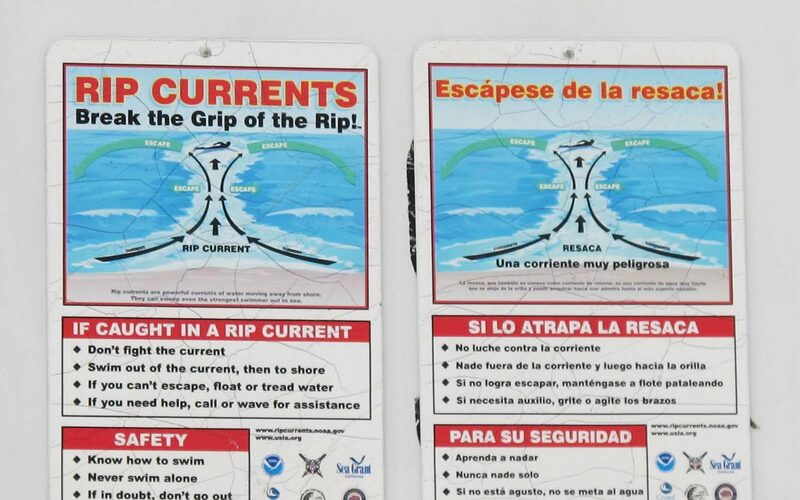 The website reports that, typically, the strongest part of a rip current is the direct line between the water’s edge and the sandbar opening, but the current will also pull in water from either side of the basin. In this way, a rip current might pull you sideways, parallel to the beach, before it pulls you outward, away from the beach. Rip currents occur when water rushes through a low point in a sandbar. Since waves keep pushing more water into the basin between the sandbar and the beach, the rip current may continue for several minutes, or even several hours. Some rip currents are brief occurrences, but others are long-term fixtures of an area. Once the receding wave makes its way through the sandbar opening and meets up with water at its own level, its pressure immediately drops. Overall, the water flow pattern has a mushroom shape. When you’re at the beach, keep an eye out for narrow, muddy streaks in the ocean where there aren’t any waves breaking, the website advises. Howstuffworks.com says that, if you get caught up in a rip current, your first instinct may be to swim against the current, back to shallow waters. In most cases, even if you’re a strong swimmer, this will only wear you out. The current is too strong to fight head-on. Instead, swim sideways, parallel to the beach. his will get you out of the narrow outward current, so you can swim back in with the waves helping you along. If it’s too hard to swim sideways while you’re being dragged through the water, just wait until the current carries you past the sandbar. The water will be much calmer there, and you can get clear of the rip current before heading back in. People drown when they thrash about in the water or expend all of their energy swimming. To survive a rip current, or any crisis in the water, you have to keep calm, and you have to conserve your energy. If you don’t think you can swim all the way back to the beach, get past the rip current and tread water. Call for help, signal to people on the beach and, if all else fails, wait for the waves to carry you in. If you’re on the beach and see somebody else caught in a rip current, call for help from a lifeguard or the police. Don’t immediately dive in and swim out to the person. It’s too risky to swim out there yourself unless you have a raft, boogie board or life preserver with you. Safety signs are located on some beaches that are notorious for strong rip currents. Make sure you take the time to read them, so you know to be extra careful. Although most water sports take place far out from the beach, it’s still important you listen carefully to your guide’s safety briefing. The experienced guides who work for Hawaii Aloha Travel are trained to keep you safe in Hawaii’s waters. So, make sure you heed their advice on all matters related to your water activity. No matter what activity you plan to undertake when you’re in Hawaii, it’s best to know the ocean dynamics going on beneath the waves, and know how to escape rip currents in Hawaii!